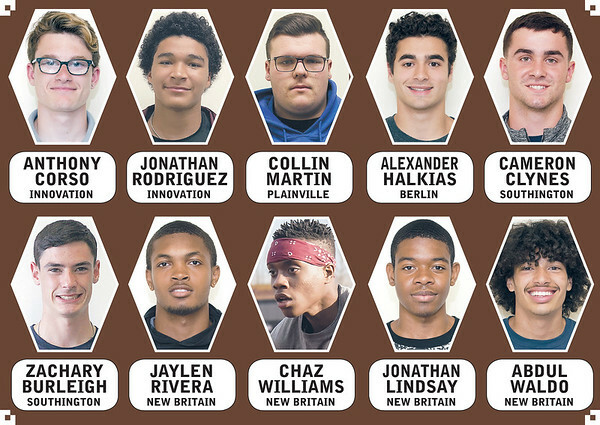 Our 2018 All-Herald Boys Track and Field Team is full of talent, and these 10 local stars have proven to be able to run, throw and jump as well as anyone with the state. Despite a young and rebuilding team, Innovation still had two athletes make our squad. The Ravens were led by Anthony Corso on the track. The junior was all-CRAL selections for his efforts in the 800-, 1,600- and 3,200-meter runs this spring, winning conference titles in all three events. Corso set school records in the 1,600 and 3,200 this season as well. He also came in ninth place at the State Open in the 2,000-meter steeplechase. With a year left to go, Corso is sure to be a huge part of Innovation’s continued progression. Innovation’s Jonathan Rodriguez proved to be one of the best jumpers in the area this season. Rodriguez was crucial in the team’s quest for the CRAL championship, winning the 110-meter hurdles and the triple jump. He finished fourth in Class S in the hurdles event. The junior consistently improved throughout the season, setting personal records three times in the hurdles and once in the triple jump. Rodriguez will be another key part for the Ravens as they look to repeat as conference champions. It may have been a down year for Plainville results wise, but Collin Martin still had a strong senior season. The Blue Devil was a standout in the discus, javelin and shot put. Martin won silver both the discus and shot put events at the Class M championship meet this season. Martin’s efforts were good enough to earn all-CCC honors as well as being named Plainville’s Best in Field. Berlin’s Alexander Halkias, a three-sport athlete, proved how dominant he was in the sprints this season. He set a new personal best and school record in the 100 at the Class MM championships, with a time of 11.26 seconds, finishing in ninth. He also broke a Berlin record in the 200 at the State Open with a time of 22.45 to finish fifth. On top of his success on the track, Halkias also gets it done in the classroom – he’s first in his class academically. Halkias, a junior, is currently looking into playing football in college. Southington was led by two seniors this season. Cameron Clynes was a star in the javelin for the Blue Knights this season, throwing 160 feet, 5½ inches, which is the fourth best in program history. Clynes earned all-conference honors this season and was the CCC-West javelin champion. He is planning on attending Stonehill College, where he is planning to try out for the track and field team. Zachary Burleigh was another strong Blue Knights senior in the field events, especially the pole vault. Burleigh won bronze at this season’s Class LL championship meet with a personal best mark of 13 feet, 6 inches. The mark is the second best in program history. Burleigh posted the same mark at the State Open, which gave him a ninth-place finish out of 24 competitors. Burleigh earned all-CCC honors yet again, making our roster for the second time. New Britain places four athletes on our All-Herald Boys Track and Field Team. Leading off for the Golden Hurricanes is Jaylen Rivera. The senior made the All-CCC team after a handful of top-10 finishes in the 100- and 200-meter sprints this season, finishing with one of the best seasons in New Britain history after moving into the top-10 in both events. Rivera will be attending Post University next season, where he will continue his track and field career. Chaz Williams has already had a storied career, and he’s only a junior. Williams did a little bit of everything for New Britain this season, competing in 18 different events and setting personal bests in 12 of them. Williams also holds school records in five different events. His best day this season came at the State Open decathlon event on June 13, when he placed in the top-10 in six of the 10 events, including a second-place finish in the 100. Jonathan Lindsay is another standout sprinter for the Hurricanes. Lindsay was a CCC-North champion in the 110- hurdles this season and followed that up with a fourth-place finish at the Class LL championships. He also earned all-conference in the 4x400 relay, with his team’s best finish being a silver medal at the CCC-North championship meet. Lindsay, a junior, is being recruited by Brandeis University. Rounding out our All-Herald squad is Abdul Waldo, a jumper for the Hurricanes, who leaves a lasting impact on the school’s program. The senior is all over the New Britain record books in the high, long and triple jumps. During the CCC Championships, Waldo won the high jump with a leap of 5-feet, 6-inches. He had previously jumped 5-feet, 10-inches, the fifth-highest in school history, earlier in the season. Waldo also had second-place finishes in the triple jump at the conference championship and at the Class LL meet, setting a mark of 44-feet, 8¾-inches later at the New England Championships to move into the top-three in New Britain history. His long jump of 19-feet, 4-inches came at the Bloomfield Invitational gave him his third mark inside the top-10 in program history. Posted in New Britain Herald, Berlin, Goodwin Tech, Innovation, New Britain, Newington, Plainville, Southington on Friday, 13 July 2018 22:03. Updated: Friday, 13 July 2018 22:06.